We landed in Zambrano on Thursday evening and immediately went to work packing food for the villages we would be visiting. Each bag of food contains 1lb of beans, 1lb of rice, sugar, two packs of spaghetti noodles, vegetable oil and tomato sauce. This will last a family of five for approximately a week. This has been a tremendous blessing, and our team raises the money to buy the supplies to provide the food. Not all the teams that visit do that and that is okay, but it's so hard to go minister to a village spiritually while people are so hungry physically. The next day, we went into the remote mountains of Honduras and held services and gave out food. What an encouragement to see how hungry people are for the word of God in this country. We used to meet under a shade tree when we first starting visiting in Honduras in 2011 and now almost every place we go has a fully finished church that has been planted and flourishing! Saturday is the big community service in Zambrano where we stay, and we hold a service and then have a huge community cookout after. We had the privilege this trip to attend some classes to help teach English and learn a little Spanish as well. On Sunday, we ministered at one of our connections in Honduras, John and Tarah Carrette's church. We had a powerful move of the Holy Spirit and had a chance to connect with our friends from Tabernaculo De Sion. Check out their sites here: http://www.tabernaculodesion.com/ and http://www.hopecenterhonduras.com/. After visiting several villages and having a chance to minister and hand out food, the main reason we came back to Honduras started on Monday evening. It was a surprising blessing when I was asked if we could move the conference from the day to night as the unemployment rate in Honduras is almost 80%! But several of the leaders had recently found jobs and now work during the day, so they asked us to have the conference at night so they could all attend. What great news this was! It's always humbling in other countries when you see someone who works during the day still walk 6-8 miles to come to a conference at night. Just let that sink in for a few minutes before moving on. We had an amazing conference training these leaders in the core classes we use at Word Alive: Freedom Track, Kingdom Culture, Theology of Leadership and Art of Leadership. We had amazing ministry times! Demons manifested and were vomited on the floor; mass baptisms of the Holy Spirit; and leaders prophesied over each other and learned how to minister in the gifts of the Holy Spirit. 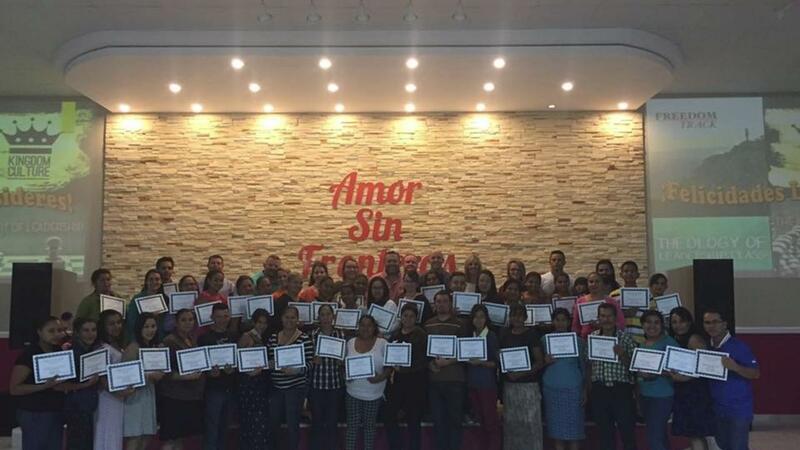 The highlight for all of us on this trip was graduating and ordaining 50 pastors that attended each night of the conference. To see people that have never had the opportunity to go to school or may never be able to attend something like this again walk across the stage and get their diploma would melt the hardest of hearts. They were so excited taking pictures with the teachers and screaming for each other. This was a humbling experience for each of us on this trip. If you have never been on a mission trip outside of the United States, then please GO. It's hard to wrap your mind around 95% of the world living outside of our country and most on less than a dollar a day. Once you have your eyes opened to this, our prayer is it will allow you to love and serve in a new way and be grateful for the freedom we have here at home. Visit our site at www.project58.com for more information on how you can pray, fast and give to be the change locally and around the world with us.